Sometimes we are called upon to treat to a patient, who is suffering from pneumonia. Pneumonia, though, can be very easy to diagnosis, and treatment is somewhat limited to the prehospital setting. Still, fast recognition, treatment, and transport are vital to patient survival. 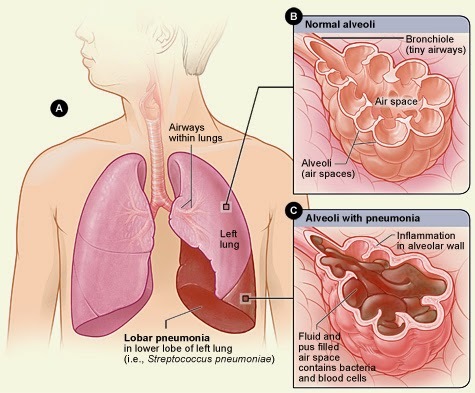 Pneumonia is when their is fluid within one or both sides of the lungs, particular in the air sacs. This is also known as an infection. This fluid, is preventing normal gaseous exchange to occur, thus causing a reduction in the amount of oxygen that is entering into the bloodstream to our organs. Things to look out for when assessing your patient, is the following: fever (hyperthermic) or hypothermic), chills, diaphoretic, cough that produces a yellowish color sputum (may be streaked with blood), shortness of breath, tachypnea, tachycardia, muscles aches and fatigue, weakness, nausea and vomiting may be present, and possibly a headache. If your patient meets some or all of the following, in most cases, your patient is suffering from pneumonia. When assessing your patients lungs, during auscultation you will notice that the patient will present with rails in effected area of the lungs. Yet, wheezing and rhonchi may also be present. In addition, during auscultation if you have the patient say "E" during the assessment, and the "E" sounds like an "A," than you have a good indicator that the patient has pneumonia. During the chest wall/lung assessment, if your percuss the chest, yo may reveal dullness over effected area (area filled with the fluid). When treating these patients, you need to make sure that you ensure a patent airway. Always follow the ABC steps. In addition, start an IV, preferably a saline lock (follow protocol), ECG monitoring, Albuterol is wheezing is present, and in some cases, if the patient's SpO2, and they meet some or all of the CPAP criteria, than you may need to place the patient on CPAP. Overall, treatment is limited in the prehospital setting. These patient's need antibiotics. So, fast recognition and transport is vital.